PM Nguyen Xuan Phuc is attending the Annual Viet Nam Business Forum 2017, which is jointly held by the Ministry of Planning and Investment, the World Bank and the International Finance Corporation. Participants to the forum are expected to focus on figuring out measures to spur productivity and industrial development in the context of the 4th Industrial Revolution as well as the development of the private sector. 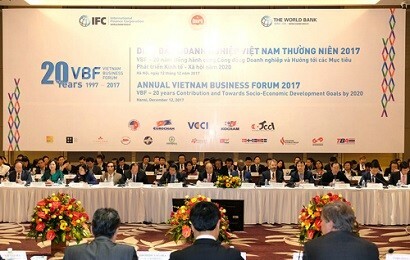 Representatives of the Viet Nam Chamber of Commerce and Industry (VCCI) and Business Associations of the Republic of Korea, Japan, the European Union and the US are expected to roll out legal and policy recommendations for Viet Nam to further improve its business climate and boost sustainable development and international integration. Viet Nam’s GDP rose from US$27 billion in 1997 when the forum was established to about US$220 billion in 2017 partly thanks to the expansion of the Vietnamese business community.